Whatever happens to his proposed yatra, BJP ‘Loh Purush’ L.K. Advani managed to shift the focus within the saffron party, the RSS and the NDA, onto himself with his headline-grabbing announcement. The one-line statement at a press briefing in Parliament House on the monsoon session’s last day was simple but effective: “I have decided to embark on a yatra and I have spoken to the party president.” The 84-year-old leader had decided he needed to be back in the reckoning and what better vehicle than to get on his favourite rath, this time to fight corruption. It was presented to the parivar as a fait accompli. Or, “In true Advani style,” as insiders put it. On that Thursday morning, Advani called BJP president Nitin Gadkari to his Prithiviraj Road residence and broke the news about the yatra. Taken by surprise, Gadkari offered to “discuss the idea with other senior party leaders and make a formal announcement later”. 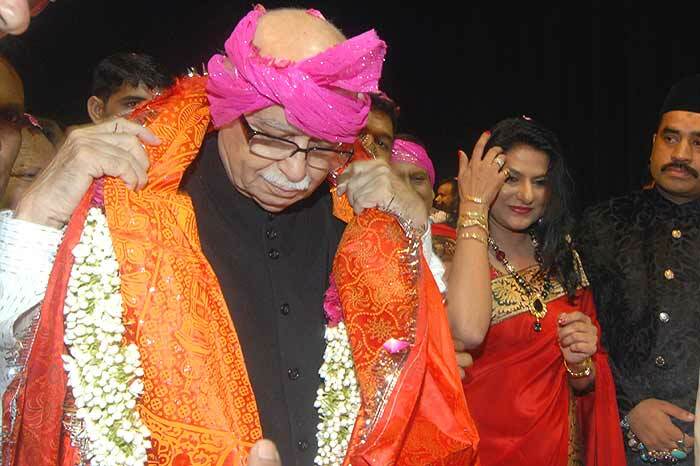 Party sources confirm that Advani told Gadkari that he would make the announcement himself. Not just that, he said that the “yatra would be nationwide”, turning down Gadkari’s suggestion that it be restricted to poll-bound states. A little before noon, Advani broke the news to senior NDA leaders, Arun Jaitley, Sushma Swaraj, Rajnath Singh, Yashwant Sinha, S.S. Ahluwalia and Sharad Yadav in Parliament. The BJP parliamentary board got together to discuss the yatra in detail only much later. “Advaniji had made up his mind and taken a decision. What could anyone say?” explains a senior party leader. The anguish of a team caught unawares echoed in RSS spokesperson Ram Madhav’s statement: “Anyone who will pursue the issue of corruption will find our support in the larger interest of the country. If it is Advaniji taking out a yatra, then we will support him as well.” A little less coy with his words was Anna Hazare, the current mascot of anti-corruption crusaders, who called the yatra nothing but a “political gimmick”. “The yatra is Advaniji’s way of reasserting himself and regain his position in the party,” says a BJP leader. Ram Madhav’s may be the public line but highly placed sources in the parivar point out: “The Sangh is very upset with Advani over the yatra. The matter was neither discussed with us nor ever brought up as a suggestion.” What has provoked the Sangh’s anger, sources say, is Advani’s refusal to oblige RSS leaders early this year when they went to him with a similar proposal, before they negotiated with Baba Ramdev to take up corruption as an issue. Months ago, senior Sangh leaders had held a meeting with Advani at his residence, suggesting to him that he resign from the Lok Sabha and become the face of an anti-corruption and bring-back-black-money campaign conceived by it. “Advaniji refused to give up his Lok Sabha seat. He did not think much of the campaign then. In fact, a senior BJP leader even told Advaniji that corruption was a non-issue. Now he has decided to go on a yatra on the same issue. How do you expect us to react?” says a senior pracharak. Indeed, the internal response to Advani’s idea has been not just tepid, both in the BJP and the Sangh, but potentially counter-productive. Insiders in the RSS reveal “the Sangh is in no mood to support the yatra. That has been made clear to Advaniji. In fact, the Sangh had even decided to send an RSS pracharak, close to Advaniji, as an emissary on September 11 telling him that the Sangh would be unable to support his yatra till he categorically announces that he would not be a prime ministerial candidate in 2014”. With the yatra all set to start on October 11, poll-bound states like Punjab, Uttarakhand and Uttar Pradesh will by default become the first litmus test for Advani. Scheduled to go to the polls in the first quarter of 2012, Punjab, where the BJP is a partner in the Shiromani Akali Dal-led government, and Uttarakhand (where it is in power) offer a strong anti-incumbency factor for the BJP, coupled with charges of corruption. The BJP is already on a weak wicket in Uttar Pradesh and if Advani’s yatra is unable to turn the situation for the party, Advani may miss out on being the prime ministerial candidate in 2014. Says a BJP leader: “Even if you don’t see the yatra as Advaniji’s claim to the PM candidature in 2014, it is certainly his way of reasserting himself within the party and an attempt to regain the position he once enjoyed in the BJP. Till a few months back, he was complaining to anyone who would care to hear that he had been marginalised within the party. Now he wants to change that.” A senior lawyer in the party, also close to Advani, explains the situation, “That’s Advaniji’s nature. He will make sure, if it’s not him, then just no one else will do. This yatra is the manifestation of that nature.” While the endgame for 2014 may have just begun, for the time being, L.K. Advani seems to have managed to deal a blow that could perhaps successfully checkmate the challenge his detractors may have thrown at him. Sir, Where To Get Off The Bus?